The outdoor area is often overlooked for its fabulous potential; do it right and you will have an entertainment hub that is the heart of your home. Summer days filled with barbeques and blow-up pools, winter evenings with a glass of wine watching the sun go down. Family get-togethers and sport played in the great outdoors—all without leaving the comfort of your own backyard! Whether you want to create a tranquil oasis just for you, or an entertaining area fit for a king, revamping your outdoor area is easier than you think! Select a new outdoor upholstery fabric for your furniture and watch your outdoor space transform. The first step of the reupholstering process is to assess the structure of your outdoor furniture. A sturdy base is essential, with strong corner braces and no damage to the overall construction. If you are searching for a piece of furniture to reupholster, don’t be put off by furniture that is best described as an eyesore—you may miss out on a prime item just waiting to be revamped! Old, damaged, or just plain ugly material may be hiding a great quality base underneath with years of life left in it. Reupholstering is like major reconstruction surgery for your furniture—the results after completion will leave you amazed with the transformation! If you have a good base, you’re ready for the next step, selecting your fabric. Outdoor fabric has unique requirements that you need to consider. Imagine finding your dream fabric and creating a beautiful outdoor masterpiece, only to have it fade or fall apart a short time later because it wasn’t suitable for outdoor conditions! Finding a suitable material is crucial for reupholstering, otherwise you will just be wasting your time (and money). Choosing the right fabric can seem overwhelming—there are so many types to choose from, you may not know where to begin! Your search will be a lot easier if you establish what you want out of your furniture fabric before you set out for the stores. #1 Quality and comfort—Your outdoor furniture is presumably going to be sat on a lot, so it needs to be of good quality to last for the long term. You will also want it to be comfortable—no one wants to spend the afternoon lounging on a scratchy chair! #2 Water resistance—Because outdoor furniture is exposed to the elements, suitable outdoor fabrics usually have a finish that will form a protective coating. Water, mould and moisture will be unable to penetrate the fabric and cause subsequent damage. Even if you plan on keeping your furniture undercover, it is highly recommended that you choose water-resistant fabric for your outdoor pieces. #3 Fading—While it is impossible to totally prevent fading from direct sunlight, some fabrics are much more durable than others in terms of how they withstand the sun’s rays. Check the packaging on your desired fabric prior to making a purchase—it should give you an indication of its weather and fading resistance. #1 Solution-dyed acrylic—This is a fabric that is dyed before being woven into yarn, meaning that the colour goes right the way through. It is a popular choice for outdoor furniture, largely because of its ability to withstand sun fading. It’s also a quick-drying material, with a tough exterior to help combat wear and tear. It is water-resistant (though not totally waterproof) making it a great choice for many types of outdoor furniture. #2 Acrylic-coated polyester—The polyester is dipped into an acrylic coating to form the colour. The keyword for this fabric is durability—it is extremely strong and long wearing, perfect for withstanding the outdoor elements. #3 Canvas—An oldie but a goodie. Canvas has long been touted as a top choice for outdoor furniture due to its ability to withstand the harsh outdoor conditions. A good choice for those who are allergic to (or looking to avoid) synthetic materials. #4 Olefin—Easy to clean and affordable, olefin gives a reasonable amount of protection from outdoor elements and comes in a wide range of colours. #5 PVC mesh—This is an extremely strong fabric that, unlike others, will not stretch. It is an easy-clean, weather-resistant fabric that is suitable when you need performance against wear and tear. Before purchasing your fabric, its best to consult with a professional to ensure that it is suitable for the furniture you wish to use it on. You can also consult with them for advice on the décor you wish to achieve, and any necessary repairs your furniture may need before the new fabric is upholstered. Upholstery recovers involve a lot of work—but the results are well worth the effort! Once you have selected your fabric, find a furniture upholstery repair technician to undertake the recovery process. If you have a much-loved outdoor furniture setting that has seen better days, consider giving it a fabric makeover. Recovering your old furniture can save you money, is good for the environment and allows you to choose a print or design that is totally customised to your own individual style. Make the most of your outdoor area, and give it the ‘wow’ factor with a refreshing new look. Outdoor upholstery fabric is a simple way of redecorating the exterior of your home, with a look that is all your own. 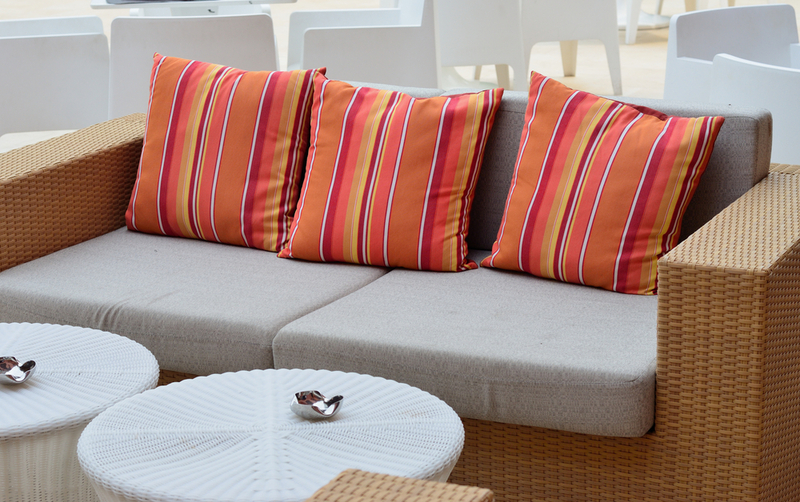 To find out more about choosing outdoor upholstery fabric, or any other furniture repairs, contact Lounge Repair Guys! Our mobile service covers all of Brisbane and our friendly team would love to help you. Phone 1300 101 510 for an obligation free quote today!